Massarah Mikati explores how Syrian-American artists are responding to the war in Syria. Leila Khoury never forgot the stunning bathhouse she saw when she visited Aleppo at the age of 15 — the intricate patterns weaving in and out of one another; the deep, dull blue painted on select sections of the walls; the intricate details that lined the multi-colored floors and ceiling. So Khoury got as close to revisiting that bathhouse as she could, recreating this distant figment of her memory by constructing the interior of the unforgettable bathhouse into a life-size diorama in an attempt to show her American audience Syrian heritage, rather than Syrian war. Khoury, a daughter of Syrian immigrants born and raised in Cleveland, Ohio, is one of many Syrian-Americans who use their artwork to cope with the Syrian Civil War, whether it be through preserving their culture and memories, exposing different perspectives of the factors at play in the war, or exploring their own identities in face of their burning country. One of the first pieces to catch the eye when walking into Mary Ann Peters’ Seattle studio is the magnificent, white carpet laid carefully across 15 feet of the floor. Upon closer observation, you realize that the carpet is in fact not woven out of fabric, but actually pieced and slabbed together with pastry flour. Intricate details and patterns are delicately etched into the carpet, painting an oriental visual with an original twist. Using the pastry flour as the main component of the staple oriental carpet was Peters’ way of showcasing how critically agriculture and drought shape the culture and politics of the region. And if there is one word to describe Peters’ artwork, “essential” would be it. The second-generation Syrian-Lebanese is on a mission to find elements of her family’s culture that are not obvious, but that are poignant. Peters’ mission shines through the unique bronzes displayed in her studio, in the shape of loaves of pita bread. She got inspiration for the piece when the met a Lebanese migrant while doing research in Mexico City. Khoury is in the same boat, fighting the same battle for history as Peters. But Khoury’s battle is under more explicit terms, fighting for the side of preserving history in the war against ISIS. Her piece “Palmyra 2015”, for example, was in response to ISIS’ destruction of the ancient remains in the historic city of Palmyra. Palmyra 2015, according to Khoury, is the best example of the artist’s grieving process throughout the Civil War — and grieving is a common theme that threads itself throughout her attempts of preserving her heritage, and her family, in the case of “Muses”. 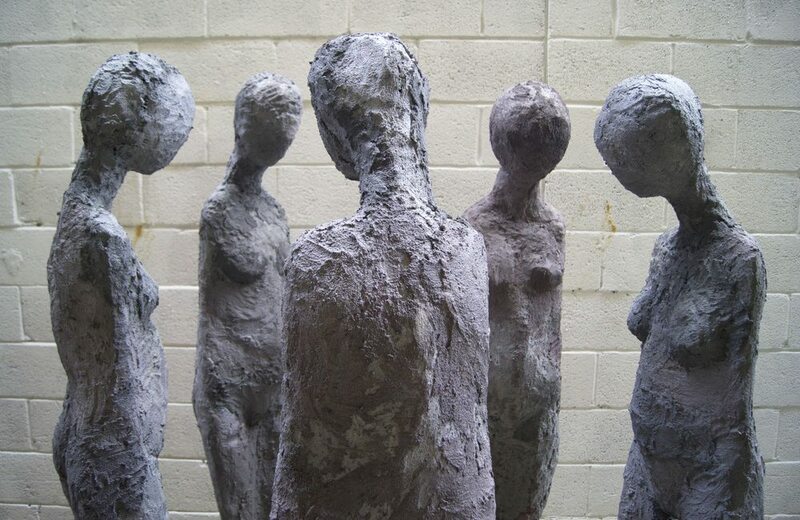 “Muses” is a collection of five statues made out of concrete and arranged around each other in a circle. In ambiguous human shapes, each statue towers at five and a half feet tall, but feels smaller as the heads droop toward the ground in mourning. Khoury drew inspiration for this piece from her mother’s family that remains residing in the war-torn city of Homs. When Nabil Mousa proudly presented his entry for the 2015 ArtPrize competition to his previously-agreed upon venue, Grand Rapids City Hall in Michigan, he was shocked to hear the city would no longer be accepting his installation, which they deemed controversial. The rejected piece caused an uproar, igniting debate and discussion that spread like wildfire nationwide — and it is Mousa’s proudest piece of work. “Paradise built on the bones of the slaughtered” is a sculpture of metal towers modeled after the Twin Towers that were destroyed in the 9/11 attacks. Attached to the sides of the towers are rods off of which torched pages from the Quran, Torah and Bible are hung. Mousa, born in Syria but raised in the U.S., focuses on the contempt of religion throughout his artwork, questioning the motives behind it with pieces that manipulate pages from the holy texts of the monotheistic religions. A new piece Mousa is working on, titled “The veil of ignorance”, consists of pages of the Bible, Quran and Torah collaged onto a canvas and covered with wrinkled, heavy burlap. “Religion has turned out to be more oppressive — it forces us to stay within rules and regulations instead of allowing us to be who we are,” Mousa said as he explained the significance of the constrictive burlap. While Mousa’s artwork portrays religion as a main point and cause of conflict, Syrian immigrant Mohamad Hafez portrays religion as a source of bliss and comfort in his artwork. Much of Hafez’s work replicates Syria, both before and during the war, in vividly realistic diorama boxes. The full-time architect recreates every detail of his memories, and current exposure to images, of Syria — depicting everything from the bullet-riddled, paint-peeling walls, to the laundry hung on lines outside homes, to the lightbulbs lit within the crumbling structures themselves. “It was all about getting a realistic reading, recreating something that is thousands of years old from scratch,” Hafez explained. But throughout many of his pieces, Arabic calligraphy is meticulously painted on the walls of his real-life windows into Syria, bringing to life verses from the Quran. Ultimately, though, Hafez pushes his audience to see points of commonality amongst the monotheistic religions. Khoury expresses this exact sentiment with her piece “Dirges”, which is an arrangement of three dome-like statues that vaguely represent spiritual buildings. And that bare, foundational identity, she said, is the same across all boards — which all the artists agree on. Mary Ann Peters has always been involved with her familial ties of Arab descent, but it was not until the past five years that she started diving into deeper explorations of her background. Once she decided that the desire to start conversation on the topics was permission enough, she launched herself into research and travels to inform the most insightful artwork she could produce. All of the artists share the same goal as Peters. And through their attempts to ignite discussions, they also find themselves in deep reflections of their own identities. For instance, while Peters’ artistic journey has helped her further discover her roots, Khoury’s has been an attempt for her to cope with the war and preserve the culture she grew up with. Mousa, on the other hand, has leaked his own problematic experiences of religion into his artwork. As an openly gay Syrian Christian, Mousa was eventually disowned by his conservative family. He realized how truly constricted he felt when working on a series called “The Burqa”, which portrayed women coerced into wearing the veil in certain countries in the Middle East. Hafez, on the other hand, has simultaneously been expressing homesickness, but also his dual identity throughout his artwork. Though he is a Syrian immigrant, Hafez and his family spent most of their lives traveling between the East and West, adapting to both. At the end of the day, these artists all have the same goals: to preserve and portray the richness of their culture, to spark productive discussions seeking peace, and to humanize the conflict.